A collaborative hub for simulation and modeling. 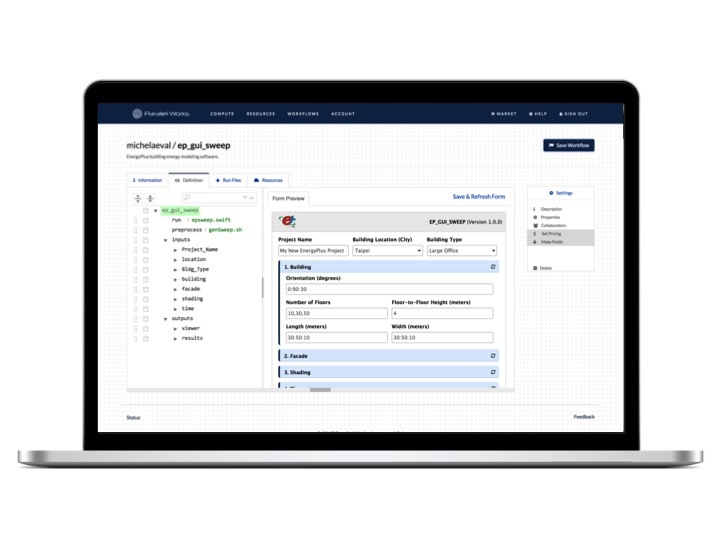 Build, configure and deploy large scale workflow applications on the Parallel Works platform. Run a range of modeling, simulation and data analysis applications on Parallel Works. 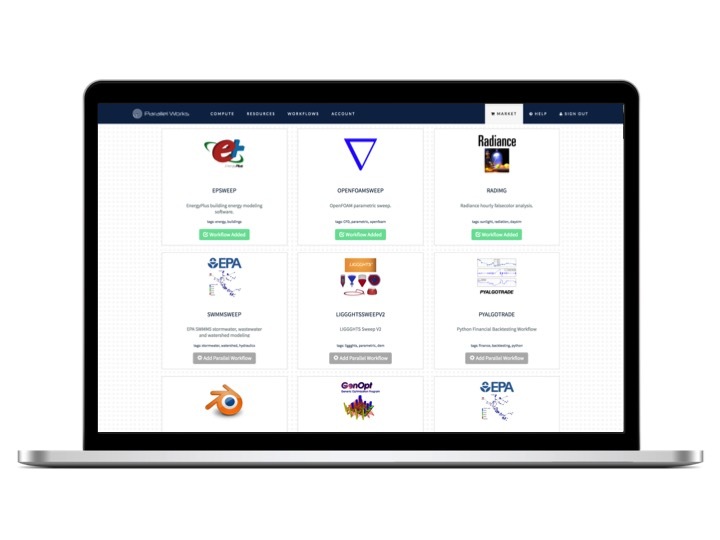 From public clouds and supercomputers to in-house clusters, the platform is highly flexible and broadly compatible to meet the needs of your most demanding studies. Execute workflows across thousands of cores using an intuitive user interface. With pre-specified inputs and outputs, the execution environment prevents errors by checking input files for data type. The powerful Swift scripting language and runtime system automatically execute your workflow across your cloud cluster. Swift has been benchmarked on 512,000 cores of the Blue Waters Supercomputer, so we are confident it is up to the task. Learn more about Swift here. An intuitive UI to configure compute resources and deploy workflows. With buttons and toggles in place of code, the interface ensures the inputs are properly defined before deployment. A simple slider system gives control to the user to set minimum and maximum parallel thresholds. The system automatically spins up a cluster based on the needs of your job, distributes the work across available cores, and shuts down once the job is complete. Control resource settings and configure new compute clusters as needed. Users can select from a range of instance types, set the maximum number of workers in a pool, and adjust settings to automatically spin up and shut down pools. 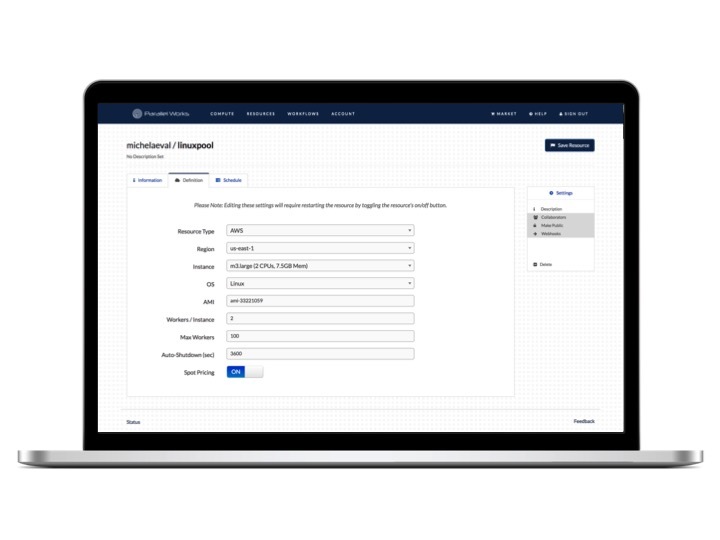 The Workflow Studio is designed for workflow developers to streamline the process of creating encapsulated workflow tools on the Parallel Works platform. This collaborative environment enables multiple teams to contribute from global or remote locations. The Workflow Manager provides a repository for workflows and enables users to edit, share and collaborate on workflows. Each user has a private Workflow Manager, and can grant collaborators access to deploy and edit the workflow. The Parallel Works Marketplace offers pre-configured workflows and standard frameworks to build upon. The Marketplace provides an opportunity for workflow developers to promote and sell the tools they’ve created to the community. Check out our Partnerships page to learn more about promoting your workflows in the Parallel Works Marketplace. 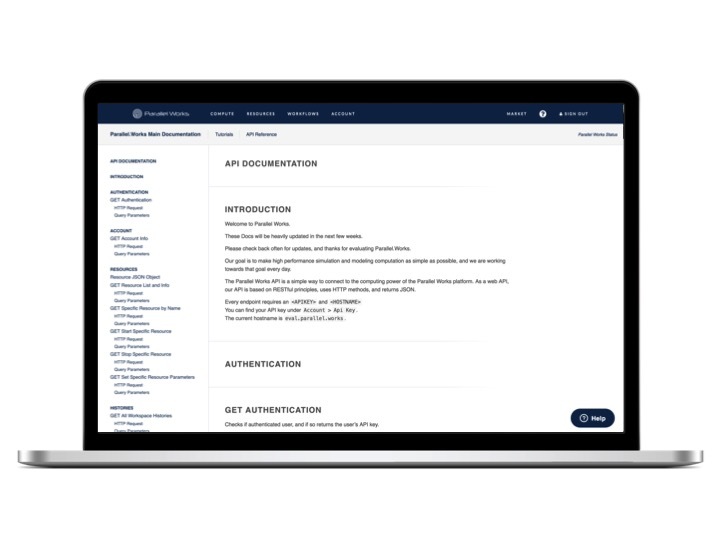 The Parallel Works API is a simple way to connect to the computing power of the Parallel Works platform. As a web API, our API is based on RESTful principles, uses HTTP methods, and returns JSON. Complete documentation can be found here. Many of our partners have successfully leveraged the Parallel Works API to enable scalable cloud solutions for their customers. Learn more about how we’ve helped them deliver powerful new capabilities for their customers.